Not to be confused with Special 8. 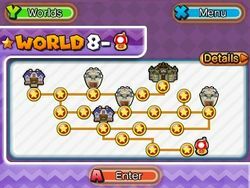 Special World 8, known as ★World 8 in-game, is the eighth and final Special World in Puzzle & Dragons: Super Mario Bros. Edition, and is a more difficult version of World 8, with the ground gray in coloration and a dark blue tint in the background. This world consists of eighteen levels and a Toad House. Dry Bowser is the boss of this world and is fought in Bowser's castle. Clearing this world unlocks Super Peach, Dry Bowser, and Bowser the Koopa King as Helpers. For a listing of course maps in ★World 8, see here. Upon reaching the branching path in the Ghost House, the player may notice a Gold Block to the right of the purple Warp Pipe and the sign. By hitting the block, the player can access a secret area, which leads to the secret exit of this course. In order to use the block, however, the player needs to clear more Light Orbs than both Water Orbs and Dark Orbs. This course does not contain any Light Orbs, however, so the player needs to bring an ally that can create them. Upon defeating the boss at the end of the secret path, the player unlocks ★World 8-3. 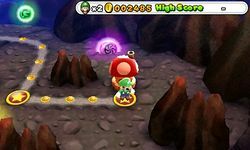 There are two ways to reach the secret exit in this course, both of which requiring an ally that can create Dark Orbs as the course does not provide them. The first way: the player must first reach the branching path (where there is a signpost, a Gold Block and a green Warp Pipe). The player must clear more Wood Orbs than Dark Orbs and Water Orbs. Taking the green Warp Pipe and going through the underwater section, the player finds another branching path (a sign and a green Warp Pipe). The player must clear more Dark Orbs than Wood Orbs to follow the path with the sign. Alternatively, the player can trigger the Gold Block at the first branching path by clearing more Dark Orbs than Wood Orbs or Water Orbs. Climbing the beanstalk and going through the cavern section, the player automatically takes a green Warp Pipe, bypassing most of the underwater section. Upon defeating the boss at the end of the secret path, the player unlocks ★World 8-7. Upon reaching the branching path in the course, the player may notice a Gold Block to the left of the two signs pointing straight ahead and a red Warp Pipe. To reach the secret exit in this course, the player needs to clear more Light Orbs than both Dark Orbs and Fire Orbs. This course does not contain any Light Orbs, however, so the player must bring an ally that can create them. Upon defeating the boss at the end of the secret path, the player unlocks ★World 8- . This page was last edited on January 20, 2018, at 18:33.